"the City of Dreaming Spires"
"Fortis est veritas" "The truth is strong"
Oxford (/ˈɒksfərd/ OKS-fərd) is a university city in south central England and the county town of Oxfordshire. With a population of approximately 155,000, it is the 52nd largest city in the United Kingdom, with one of the fastest growing populations in the UK, and it remains the most ethnically diverse area in Oxfordshire county. The city is 51 miles (82 km) from London, 61 miles (98 km) from Bristol, 59 miles (95 km) from Southampton, 57 miles (92 km) from Birmingham and 24 miles (39 km) from Reading. Oxford was heavily damaged during the Norman Invasion of 1066. Following the conquest, the town was assigned to a governor, Robert D'Oyly, who ordered the construction of Oxford Castle to confirm Norman authority over the area. The castle has never been used for military purposes[dubious – discuss] and its remains survive to this day. D'Oyly set up a monastic community in the castle consisting of a chapel and living quarters for monks (St George in the Castle). The community never grew large but it earned its place in history as one of Britain's oldest places of formal education. It was there that in 1139 Geoffrey of Monmouth wrote his History of the Kings of Britain, a compilation of Arthurian legends. Additionally, there is evidence of Jews living in the city as early as 1141, and during the 12th century the Jewish community is estimated to have numbered about 80–100. The city was besieged during The Anarchy in 1142. Oxford's prestige was enhanced by its charter granted by King Henry II, granting its citizens the same privileges and exemptions as those enjoyed by the capital of the kingdom; and various important religious houses were founded in or near the city. Oxford's status as a liberty obtained from this period until the 19th century. A grandson of King John established Rewley Abbey for the Cistercian Order; and friars of various orders (Dominicans, Franciscans, Carmelites, Augustinians and Trinitarians) all had houses of varying importance at Oxford. Parliaments were often held in the city during the 13th century. The Provisions of Oxford were instigated by a group of barons led by Simon de Montfort; these documents are often regarded as England's first written constitution. Oxford Town Hall was built by Henry T. Hare; the foundation stone was laid on 6 July 1893 and opened by the future King Edward VII on 12 May 1897. The site has been the seat of local government since the Guild Hall of 1292 and though Oxford is a city and a Lord Mayoralty, the building is still called by its traditional name of "Town Hall". On 6 May 1954, Roger Bannister, a 25-year-old medical student, ran the first authenticated sub-four-minute mile at the Iffley Road running track in Oxford. Although he had previously studied at Oxford University, Bannister was studying at St Mary's Hospital Medical School in London at the time. He later returned to Oxford University and became Master of Pembroke College. Oxford's second university, Oxford Brookes University, formerly the Oxford School of Art, then Oxford Polytechnic, based at Headington Hill, was given its charter in 1991 and for ten years has been voted the best new university in the UK. It was named to honour the school's founding principal, John Henry Brookes. The influx of migrant labour to the car plants and hospitals, recent immigration from south Asia, and a large student population, have given Oxford a notably cosmopolitan character, especially in theHeadington and Cowley Road areas with their many bars, cafes, restaurants, clubs, Asian shops and fast food outlets and the annual Cowley Road Carnival. Oxford is one of the most diverse small cities in Britain: the most recent population estimates for 2005 showed that 27% of the population were from ethnic minority groups, including 16.2% from non-white ethnic minority ethnic groups (ONS). These figures do not take into account more recent international migration into the city; more than 10,000 people from overseas have registered for National Insurance Numbers in Oxford in 2005/06 and 2006/07. Oxford has a maritime temperate climate (Köppen: Cfb). Precipitation is uniformly distributed throughout the year and is provided mostly by weather systems that arrive from the Atlantic. The lowest temperature ever recorded in Oxford was −16.6 °C (2.1 °F) in January 1982. The highest temperature ever recorded in Oxford is 35.6 °C (96 °F) in August 2003 during the 2003 European heat wave. Oxford's climate is similar to that of Pershore, Worcestershire. ^ Weather station is located 0.7 miles (1.1 km) from the Oxford city centre. Oxford is at the centre of the Oxford Green Belt, which is an environmental and planning policy that regulates the rural space in Oxfordshire surrounding the city which aims to prevent urban sprawl and minimize convergence with nearby settlements. The policy has been blamed for the large rise in house prices in Oxford, making it the least affordable city in the UK outside London, with estate agents calling for brownfield land inside the green belt to be released for new housing. The vast majority of area covered is outside the city, but there are some green spaces within that are covered by the designation such as much of the Thames and Cherwell river flood-meadows, and the village of Binsey, along with several smaller portions on the fringes. Other landscape features and places of interest covered include Cutteslowe Park and the mini railway attraction, the University Parks, Hogacre Common Eco Park, numerous sports grounds, Aston's Eyot, St Margaret's Church and well, and Wolvercote Common and community orchard. Oxford's economy includes manufacturing, publishing and science-based industries as well as education, research and tourism. The city centre is relatively small, and is centred on Carfax, a cross-roads which forms the junction of Cornmarket Street (pedestrianized), Queen Street (semi-pedestrianized), St Aldate's and the High. Cornmarket Street and Queen Street are home to Oxford's various chain stores, as well as a small number of independent retailers, one of the longest established of which is Boswell's, founded in 1738. St Aldate's has few shops but several local government buildings, including the town hall, the city police station and local council offices. The High (the word street is traditionally omitted) is the longest of the four streets and has a number of independent and high-end chain stores, but mostly university and college buildings. There are two small shopping malls in the city centre: The Clarendon Centre and the Westgate Centre. The Westgate Centre is named for the original West Gate in the city wall, and is at the west end of Queen Street. A major redevelopment and expansion to 750,000 sq ft (70,000 m2), with a new 230,000 sq ft (21,000 m2) John Lewis department store and a number of new homes, was completed in October 2017. There are also bus services to the John Radcliffe Hospital (from Thornhill and Water Eaton/Oxford Parkway) and to the Churchill and Nuffield Hospitals (from Thornhill). As of 2015[update], Oxford has one of the largest urban park and ride networks in the UK. Its five sites have a combined capacity of 4,930 car parking spaces, served by 20 Oxford Bus Company double deck buses with a combined capacity of 1,695 seats. By comparison, York park and ride has six sites with a combined total of 4,970 parking spaces served by 35 First York buses, but they are single deckers with a combined capacity of 1,548 seats. In November 2014 all Oxford Bus Company buses within the Oxford SmartZone area have free WiFi installed. Oxford's central location on several transport routes means that it has long been a crossroads city with many coaching inns, although road traffic is now strongly discouraged from using the city centre. From 2020, a new Zero Emission Zone will mean any vehicles which are not zero-emission will be banned from the city centre during certain hours. Holywell Music Room is said to be the oldest purpose-built music room in Europe, and hence Britain's first concert hall. Tradition has it that George Frideric Handel performed there, though there is little evidence. Joseph Haydn was awarded an honorary doctorate by Oxford University in 1791, an event commemorated by three concerts of his music at the Sheldonian Theatre, directed by the composer and from which his Symphony No. 92 earned the nickname of the "Oxford" Symphony. Victorian composer Sir John Stainer was organist at Magdalen College and later Professor of Music at the university, and is buried in Holywell Cemetery. Oxford, and its surrounding towns and villages, have produced many successful bands and musicians in the field of popular music. The most notable Oxford act is Radiohead, who all met at nearby Abingdon School, though other well known local bands include Supergrass, Ride, Swervedriver, Lab 4, Talulah Gosh, the Candyskins, Medal, the Egg, Unbelievable Truth, Hurricane No. 1, Crackout, Goldrush and more recently, Young Knives, Foals, Glass Animals, Dive Dive and Stornoway. These and many other bands from over 30 years of the Oxford music scene's history feature in the documentary film Anyone Can Play Guitar?. In 1997, Oxford played host to Radio 1's Sound City, with acts such as Travis, Bentley Rhythm Ace, Embrace, Spiritualized and DJ Shadow playing in various venues around the city including Oxford Brookes University. The city's leading football club, Oxford United, are currently in League One, the third tier of league football, though they enjoyed some success in the past in the upper reaches of the league. They were elected to the Football League in 1962, reached the Third Division after three years and the Second Division after six, and most notably reached the First Division in 1985 – 23 years after joining the Football League. They spent three seasons in the top flight, winning the Football League Cup a year after promotion. The 18 years that followed relegation in 1988 saw their fortunes decline gradually, though a brief respite in 1996 saw them win promotion to the new (post Premier League) Division One in 1996 and stay there for three years. They were relegated to the Football Conference in 2006, staying there for four seasons before returning to the Football League in 2010. They play at the Kassam Stadium (named after former chairman Firoz Kassam), which is near the Blackbird Leys housing estate and has been their home since relocation from the Manor Ground in 2001. The club's notable former managers include Ian Greaves, Jim Smith, Maurice Evans, Brian Horton, Ramon Diaz and Denis Smith. Notable former players include John Aldridge, Ray Houghton, Tommy Caton, Matt Elliott, Dean Saunders and Dean Whitehead. Oxford City FC is a semi-professional football club, separate from Oxford United. It plays in the Conference South, the sixth tier, two levels below the Football League in the pyramid. Oxford City Nomads FC are a semi-professional football club who ground-share with Oxford City and play in the Hellenic league. In 2013, Oxford Rugby League entered rugby league's semi-professional Championship 1, the third tier of British rugby league. Oxford Cavaliers, who were formed in 1996, compete at the next level, the Conference League South. Oxford University (The Blues) and Oxford Brookes University (The Bulls) both compete in the rugby league BUCS university League. Oxford University Cricket Club is Oxford's most famous club with more than 300 Oxford players gaining international honours, including Colin Cowdrey, Douglas Jardine and Imran Khan. The Bridge of Sighs links sections of Hertford College: as seen from New College Lane with the Sheldonian Theatre in the background. University Church of St Mary the Virgin as seen from Radcliffe Square. Broad Street, showing the main entrances to Trinity and Balliol Colleges, and obliquely, the frontage of Exeter College from the Sheldonian Theatre. Carfax Tower at Carfax, the junction of the High Street, Queen Street, Cornmarket and St Aldate's streets at what is considered by many to be the centre of the city. High Street as viewed from St Mary's, looking east, with Magdalen College in the distant background. Merton College Chapel and Corpus Christi College as viewed from the Oriel Square entrance to Merton Street. 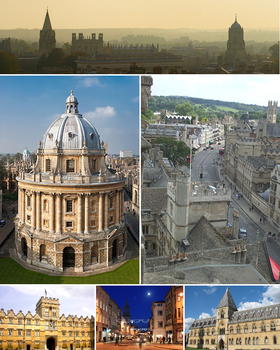 ^ "Key Facts about Oxford". Oxford City Council. Retrieved 4 January 2019. ^ a b Williams, Tom (15 May 2018). "Oxford welcomes new Lord Mayor Colin Cook with traditional ceremony". Oxford Mail. Retrieved 2 July 2018. ^ a b "Oxford City Council Executive Board announced". Oxford City Council. 15 May 2018. Retrieved 2 July 2018. ^ UK Census (2011). "Local Area Report – Oxford Local Authority (1946157324)". Nomis. Office for National Statistics. Retrieved 9 February 2018. ^ Upton, Clive; et al., eds. (2001). The Oxford Dictionary of Pronunciation for Current English. Oxford, England: Oxford University Press. p. 734. ISBN 978-0-19-863156-9. ^ Dictionary.com, "oxford" in Dictionary.com Unabridged. Source location: Random House, Inc. http://dictionary.reference.com/browse/oxford. Available: http://dictionary.reference.com. Accessed: 4 July 2012. ^ "United Kingdom: 1000 Largest Cities by population". The Geographist. November 2013. Archived from the original on 29 January 2014. Retrieved 12 January 2014. ^ "British urban pattern: population data" (PDF). ESPON project 1.4.3 Study on Urban Functions. European Spatial Planning Observation Network. March 2007. p. 119. Archived from the original (PDF) on 24 September 2015. Retrieved 7 August 2013. ^ "Census 2011 result shows increase in population of the South East". Ons. ^ "Ethnicity in Oxfordshire" (PDF). ^ Sager 2005, p. 36. ^ "A Handy Guide to Oxford, ch. 2". Penelope.uchicago.edu. Retrieved 17 April 2010. ^ "The St Brice's Day Massacre". History Today Volume 52 Issue 11 November 2002. Retrieved 25 June 2017. ^ "Oxford Viking massacre revealed by skeleton find". bbc.com. Retrieved 25 June 2017. ^ "When Vikings put Oxford to the torch". The Oxford Times 10 February 2010. Retrieved 25 June 2017. ^ "The Jewish Community of Oxford". The Museum of the Jewish People at Beit Hatfutsot. ^ Crouch, D. (2013). The Reign of King Stephen: 1135-1154 (2nd ed.). London: Routledge. p. 203. ISBN 978-1-31789-297-7. ^ "Oxford charter 1191". whatdotheyknow.com. Retrieved 17 April 2010. ^ Jenkins, Vivian (1996). Kings & Queens. HarperCollins. ISBN 0-00-472295-7. ^ "Ridley, Latimer, and Cranmer: the Oxford Martyrs". Westminster Seminary California. Archived from the original on 25 May 2014. Retrieved 25 May 2014. ^ Cockayne, Emily (2007). Hubbub: Filth Noise & Stench in England. Yale University Press. pp. 134–136. ISBN 978-0-300-13756-9. ^ a b Simpson 1997, p. 59. ^ a b Simpson 2001, p. 9. ^ "Cowley Barracks". Headington at War. Archived from the original on 8 November 2014. Retrieved 7 November 2014. ^ History of the University of Oxford: Volume VIII: The Twentieth Century – Oxford Scholarship. doi:10.1093/acprof:oso/9780198229742.001.0001. ^ "Oxford Business Group Country Reports". hbs.edu. ^ "Exhibition remembers refugees who fled to Oxford before and during World War II". Archived from the original on 21 October 2012. ^ Neil Harvey. "College life in wartime". ox.ac.uk. Archived from the original on 15 May 2009. ^ "1954: Bannister breaks four-minute mile". bbc.co.uk. Retrieved 25 May 2014. ^ Oxford Brookes University, 'Awards and Rankings' Archived 6 September 2013 at the Wayback Machine. Retrieved 19 August 2013. ^ Neighbourhood Statistics. "ONS Population Estimates 2005". Neighbourhood.statistics.gov.uk. Retrieved 17 April 2010. ^ "Department for Work and Pensions". Dwp.gov.uk. Archived from the original on 17 April 2009. Retrieved 17 April 2010. ^ "Pershore climate". Met Office. Retrieved 11 March 2017. ^ "Radcliffe Meteorological Station". Retrieved 17 March 2008. ^ "Oxford 1981–2010 averages". Met Office. Retrieved 5 April 2019. ^ "RMS Summary of Long Period Observations". University of Oxford. Retrieved 5 April 2019. ^ "Ethnicity". Oxford City Council. Retrieved 11 August 2018. ^ "CPRE:The Oxford Green Belt: Key Facts". www.cpreoxon.org.uk. ^ "Oxford Green Belt Study Final Report Prepared by LUC October 2015" (PDF). oxfordshire.gov.uk. ^ "Home – Digital Oxford". Digital Oxford. Retrieved 3 June 2015. ^ "Passle – become a thought leader". Passle: Don't have time to blog?. Retrieved 3 June 2015. ^ "Brainomix". Brainomix. Retrieved 5 June 2015. ^ "Labstep". angel.co. Retrieved 3 June 2015. ^ "Learn English in Oxford". oxford-royale.co.uk. Retrieved 25 May 2014. ^ a b c d Woolley, Liz (2010). "Industrial Architecture in Oxford, 1870 to 1914". Oxoniensia. Oxfordshire Architectural and Historical Society. LXXV: 78. ISSN 0308-5562. ^ Page, William, ed. (1907). A History of the County of Oxford, Volume 2: Industries: Malting and Brewing. Victoria County History. Archibald Constable & Co. pp. 225–277. ^ Richmond, Lesley; Turton, Alison (1990). The Brewing industry: a guide to historical records. p. 165. ISBN 978-0-7190-3032-1. ^ "History of Headington, Oxford". Headington.org.uk. 19 April 2009. Retrieved 17 April 2010. ^ "Morrells Brewery up for sale". Archive.thisisoxfordshire.co.uk. Archived from the original on 1 December 2008. Retrieved 17 April 2010. ^ www.quaffale.org.uk (22 September 2001). "Morrells Brewery Ltd". Quaffale.org.uk. Retrieved 17 April 2010. ^ "Jericho Echo". Pstalker.com. Retrieved 17 April 2010. ^ "England | Brewer buys pub chain for £67m". BBC News. 18 June 2002. Retrieved 17 April 2010. ^ "Brewery site plan nears final hurdle". Archive.thisisoxfordshire.co.uk. 19 February 2001. Archived from the original on 25 December 2008. Retrieved 17 April 2010. ^ "Bell Founders". Dove's Guide for Church Bell Ringers. Retrieved 8 March 2011. ^ "Introduction and history". University of Oxford. Retrieved 22 September 2016. ^ a b "International students". University of Oxford. Retrieved 22 September 2016. ^ "World University Rankings 2016–2017". Times Higher Education. September 2016. Retrieved 22 September 2016. ^ Hearn, Dan (19 August 2009). "Oxford tourism suffers triple whammy". Oxford Mail. Retrieved 1 March 2010. ^ "About Boswells". Boswells-online.co.uk. Archived from the original on 23 November 2007. Retrieved 10 January 2010. ^ "Clarendon Shopping Centre". Clarendoncentre.co.uk. Retrieved 10 January 2010. 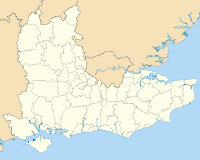 ^ "Visit Oxford's premier shopping centre — the Westgate Shopping Centre". Oxfordcity.co.uk. 18 May 2009. Archived from the original on 2 February 2009. Retrieved 10 January 2010. ^ "Blackwell's Books, Oxford". britainexpress.com. Retrieved 25 May 2014. ^ "Libraries". University of Oxford. Archived from the original on 16 December 2012. ^ "Bodleian Library Website". Oxford University Bodleian Library. Retrieved 18 February 2016. ^ MacGregor, A. (2001). The Ashmolean Museum. A brief history of the museum and its collections. Ashmolean Museum & Jonathan Horne Publications, London. ^ "Ashmolean Museum website, What's In the Ashmolean". Oxford University Ashmolean Museum. Retrieved 18 February 2016. ^ "Pitt Rivers Museum Website, About Augustus Pitt Rivers". University of Oxford Pitt Rivers Museum. Archived from the original on 17 April 2016. Retrieved 18 February 2016. ^ "Visiting museums, libraries & places of interest – University of Oxford website". Retrieved 22 January 2016. ^ "Museums and Galleries – Experience Oxfordshire website". Retrieved 22 January 2016. ^ "SAPPHIRE – Aylesbury to Oxford via Haddenham, Thame and Wheatley 280". Timetables. Arriva Shires & Essex. Retrieved 24 September 2015. ^ "FAQs frequently asked questions". Sapphire. Arriva UK Bus. Retrieved 24 September 2015. ^ "Park and ride car parks". Roads and transport. Oxfordshire County Council. Archived from the original on 25 September 2015. Retrieved 24 September 2015. ^ "Oxford Bus Company Fleet List" (PDF). Oxford Bus Company. August 2015. Retrieved 24 September 2015. ^ Holley, Mel (18 June 2014). "Fully electric York park-and-ride site means network now UK's largest". RouteOne. Diversified Communications. Archived from the original on 31 January 2016. Retrieved 24 September 2015. ^ "First York" (PDF). Unofficial Fleetlist. Sheffield Omnibus Enthusiasts Society. 12 September 2015. Archived from the original (PDF) on 25 September 2015. Retrieved 24 September 2015. ^ "Smart ticketing". Sustainability. Go-Ahead Group. Archived from the original on 6 February 2015. ^ "Free Wi-Fi on city buses and buildings as Oxford gets Super Connected". Newsroom. Oxford City Council. 13 October 2014. ^ Oxford Bus Company (4 November 2014). "Free Wi-Fi on buses announced as Oxford gets Super Connected!". WordPress. ^ "Oxford bus users to get free wifi". News. ITV. ^ Little, Reg (15 July 2010). "Transport revolution". The Oxford Times. Oxford: Newsquest (Oxfordshire) Ltd. pp. 1–2. Retrieved 15 July 2010. ^ Holley, Mel (10 September 2014). "Gyrodrive debuts in Oxford". RouteOne. Diversified Communications. Archived from the original on 31 January 2016. Retrieved 24 September 2015. ^ "2011 Census Analysis – Cycling to Work". ONS. 26 March 2014. Retrieved 23 August 2014. ^ Simpson 1997, p. 101. ^ Simpson 2001, p. 57. ^ a b MacDermot 1931, p. 432. ^ Cooke 1960, p. 70. ^ a b MacDermot 1927, p. 300. ^ a b MacDermot 1927, p. 327. ^ MacDermot 1927, p. 498. ^ MacDermot 1927, p. 551. ^ MacDermot 1931, p. 27. ^ MacDermot 1927, pp. 180–181. ^ Mitchell & Smith 2005, Historical Background. ^ Mitchell & Smith 2005, fig. 8. ^ "Welcome to". East West Rail. 18 August 2014. Retrieved 23 August 2014. ^ "Western Section". East West Rail. 18 August 2014. Retrieved 23 August 2014. ^ "Central Section". East West Rail. 18 August 2014. Retrieved 23 August 2014. ^ "Eastern Section". East West Rail. 18 August 2014. Archived from the original on 7 August 2014. Retrieved 23 August 2014. ^ Thacker, Fred. S. (1968) . The Thames Highway: Volume II Locks and Weirs. Newton Abbot: David and Charles. ^ Compton, Hugh J. (1976). The Oxford Canal. Newton Abbot: David & Charles. ISBN 978-0-7153-7238-8. ^ "Oxford drop plans to ban private vehicles in new clean air proposals". ^ "Oxford Student Radio". oxideradio.co.uk. Retrieved 9 October 2010. ^ "That's Oxfordshire". media.info. Retrieved 11 June 2018. ^ Ffrench, Andrew (7 April 2015). "New Oxfordshire community TV channel 'just weeks from launch'". Oxford Mail. Retrieved 11 June 2018. ^ "UK Indymedia – Oxford indymedia". Indymedia.org.uk. Archived from the original on 6 January 2009. Retrieved 17 April 2010. ^ "Jericho Echo". Jericho Echo. Archived from the original on 23 December 2014. Retrieved 17 April 2010. ^ "Oxford Prospect". Oxford Prospect. Retrieved 17 April 2010. ^ Tyack, Geoffrey (1998). Oxford: An architectural guide. Oxford University Press. pp. 187–188. ISBN 978-0-14-071045-8. ^ "Exploring Wadham's Holywell Music Room". Wadham College. 21 February 2017. Retrieved 1 December 2018. ^ "Haydn in England". Oxford University Department for Continuing Education. 2018. Retrieved 1 December 2018. ^ "Notable people buried in Oxford". Oxford City Council. Retrieved 1 December 2018. ^ "Discography for NME Compilation Cassette for Oxford Sound City". ^ "Welcome to OURLFC". Oxford University Rugby League. Retrieved 28 October 2015. ^ "Oxford Brookes University Rugby League". Facebook. Retrieved 27 October 2015. ^ "International Players". Oxford University Rugby Club. ^ Knox, Michael (27 June 2015). "RUGBY UNION: London Welsh quit Oxford's Kassam Stadium - but could be back". Oxford Mail. Retrieved 11 March 2017. ^ "oxfordjuniorstars.co.uk". oxfordstars.co.uk. Archived from the original on 17 April 2011. ^ "International Players". Oxford University Cricket in the Parks. ^ "Contact Us". Oxford University Boat Club. Retrieved 2 August 2018. ^ a b c d e f "Oxford's International Twin Towns". Oxford City Council. Archived from the original on 9 January 2015. Retrieved 24 January 2015. ^ Jérôme Steffenino, Marguerite Masson. "Ville de Grenoble – Coopérations et villes jumelles". Grenoble.fr. Archived from the original on 14 October 2007. Retrieved 29 October 2009. Saint, Andrew (1970). "Three Oxford Architects". Oxoniensia. Oxfordshire Architectural and Historical Society. XXXV. Archived from the original on 28 September 2007. Retrieved 22 January 2019. Howarth, Osbert John Radcliffe (1911). "Oxford" . Encyclopædia Britannica. 20 (11th ed.). pp. 405–414. This page was last edited on 20 April 2019, at 05:34 (UTC).